I first heard of 'hot spots' at Flylady. (If you've never checked Flylady out - I encourage you to! I've gotten a lot of valuable ideas from her site. Although I don't implement her system, there is still a LOT of great tips and tricks). 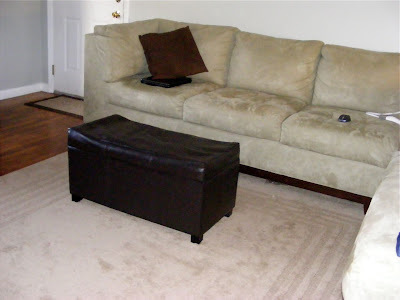 If you aren't familiar with the term, it is a spot in your home that accumulates stuff. 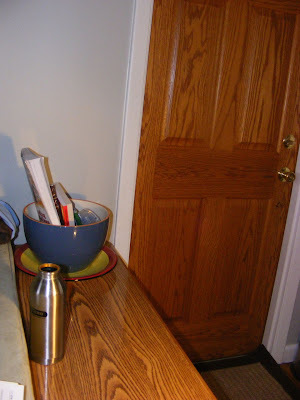 We all have them - the spot right inside the door where we throw the mail, the dining room table, the kitchen counter. Ever since we've heard the term, we affectionately refer to several spots in our home as 'hot spots'. Because we get tired of them looking so awful, we have chosen to make designated hot spots. We still need to go through them periodically and cull items, but they are contained until that time. Here are a couple of examples of the designated hot spots in our home. All the doors in our house open into the main living area. We have this large coffee cup (It is actually a planter, but I have repurposed it) right inside the door. It's a place to toss small things. As you can see, it is also used for some of the current books we are using. We have one main living area in our house. It can get pretty cluttered and lived in. So, we use this 'hot spot'. Can you see it? Yep. The ottoman is a storage ottoman. We use it to store diapers and wipes (to make quick changes easy!!). 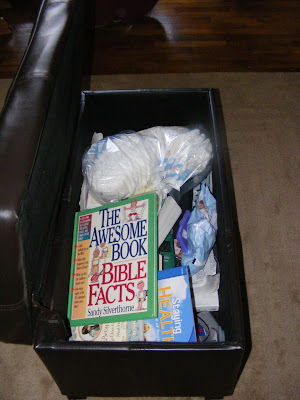 Aaron stores all his 'stuff' in there along with the read-alouds and bible books for our homeschool. We also just toss odds and ends in here if we need to make a quick clean up. If it's on the couch or the floor - there's a good chance it will end up in here. I think having hot spots are inevitable. What we've tried to do is disguise them. I still need to go through the hot spots periodically . . . . but until I can get to them they are hidden from view. Where are your hot spots? Is there anything you can do to make your hot spot a little more invisible to others? Do a little brainstorming and let me know what you come up with! I'm always looking for creative solutions to storage needs. Yep we have at least 3 hot spots. probably more!!! And they're not very hidden. Great ideas, I'll be working on these!!! I like Megan have several! I would love for you to come give me some ideas on how to conceal them!!! Our piano is a hotspot. (THe one that needs to be tuned) My son piles his crud on there everyday. FLylady helped me with a lot of stuff. I now wear make-up even when I am at home and I get my laundry done EVERYDAY and clean my sink. Love her. THanks for sharing about hotspots. I have some to put out! my whole house is a hot spot...i'm in the last two weeks of pregnancy, and can't imagine cleaning my house or doing housework...where things land, they stay. I used to be great at flylady.